Variety: This William Wyler romantic comedy-drama [from a story by Dalton Trumbo] is the Graustarkian fable in modern dress, plus the Cinderella theme in reverse. He times the chuckles with a never-flagging pace, puts heart into the laughs, endows the footage with some boff bits of business and points up some tender, poignant scenes in using the smart script and the cast to the utmost advantage. Empire: Wyler was as enchanted with Hepburn as he was with his glorious locations and, while he indulged his usual passion for retakes, he allowed more improvisation than usual and was rewarded with a film of such freewheeling spontaneity that it became one of Hollywood's biggest international hits of the decade. It also landed 10 Oscar nominations and became such a firm favourite of John F. Kennedy that he watched it as a pressure release at the height of the Cuban Missile Crisis and the Soviets capitulated the next day. Witty, warm and beautifully filmed by Franz Planer and Henri Alekan, it remains an unabashed romantic delight, with Hepburn particularly luminescent. The Dissolve: Roman Holiday made such an indelible impression on the general public that when they imagine an elegant, graceful princess, it’s likely the image of Hepburn’s Princess Ann springs to mind as readily as real-life princesses like Princess Diana or Princess Grace of Monaco. This was the film that would introduce the Hepburn the world never stop falling in love with: beautiful, winsome, blessed with remarkable gifts she’s all too eager to shrug off, and imbued with a small streak of mischief that keeps her from being too perfect. She’s the woman every woman wants to be and every man wants to marry, the people’s princess, a beauty with both a spark of the divine and a common touch. 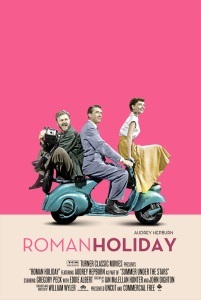 The irresistible fantasy of Roman Holiday is that as much as we’d like to have at least a fraction of Ann’s grace and beauty, she would happily give up the gilded cage of royalty for a chance to live in our loud, crass, vulgar little world. It’s a different kind of princess story, one where the princess would rather wear pajamas and drink Coca-Cola and mingle with the common people than endure another dreadful ball where she’s expected to be gracious and lovely to a series of ancient visiting dignitaries, many of whom seem to have died several years before the film opens but don’t know it yet. Audrey Hepburn really believed that Peck had lost his hand in the Mouth of Truth. I love this movie for the honesty of the ending. I saw Roman Holiday for the first time around 5 years ago, and I instantly fell in love (with the movie, and Gregory Peck). Easily one of my favorite movies. At one point in the movie princess Ann asks for Joe's address (Via Margutta 51) so she could send him back the money she borrowed from him. I like to imagine that Ann remembers Joe's address and writes to him, and they keep in touch that way. It is really hard to imagine this movie with anybody but Hepburn in the main role. Gregory Peck and Eddie Albert turn in fine performances but it really is Hepburn's movie -- the only entity she's at risk of losing out to is the city of Rome itself. I had loved this movie for years even before I visited Rome, but found an additional appreciation for it afterward. The style and politics and sensibilities depicted in the movie are 60 years gone but underneath the 1950s clothes and cars and signage the ancient bits of the eternal city shine through so recognizably it's an extra treat. Just saw this tonight for the first time, though I was familiar with the plot from having watched a TV remake back in the 1987. Audrey Hepburn really was such a jewel. I watched this film through a run of watching classic films (including a handful of powell and pressburger films) and I was incredibly impressed. There's a wealth of smart funny films out there which aren't exactly forgotten but are old enough that most people haven't seen them despite their superiority to most romantic comedies that came out of the nineties (maybe not a difficult standard to beat, but still). I love the ending. This is one of those movies that I've known of forever, but fell through the cracks until I was well into adulthood. And when i saw it for the first time, it blew my mind. My brother and I caught it together. Audrey is Audrey. She's just gorgeous in everything and her character's transformation in the movie shows just how marvelous an actress she is. My brother refers to Gregory Peck's character as Joe Bradley, All American, who brings together all that was good and decent in Hollywood's conception of American men in the fifties. Eddie Albert is a lot fun. I'd seen him in other things before, but only really had as a solid point of comparison his work in Green Acres. This was totally different and very pleasing to watch as Eddie plays Joe's compadre and documenter of the princess's day out. And the end with the press conference and then Gregory Peck doing his thing in an empty room, perfectly fits the mood.